Also known as Iolcus, this was a Mycenaean city state near Thessaly in eastern central Greece, on the Aegean coast. The ruins of the city are close to Demetrias (Dimini), near the Port of Volos, where a Mycenaean palace has recently been excavated. Iolkos' main claim to fame was as the birthplace of Jason, leader of the Argonauts, who travelled to Kolkis (Colchis) to secure the Golden Fleece. Dimini itself has provided the most complete picture of a Neolithic settlement yet to be discovered in Greece. The settlement existed on the hill in the fifth millennium BC, surrounded by enclosures (periboloi). Late Neolithic pottery found there has helped the dating of pottery throughout all of Greece. The area remained settled, growing slowly into the second millennium BC, which saw the arrival of the Mycenaeans in Greece. They built a large and very important Mycenaean settlement which was discovered to the south-west of the hill. This was identified as ancient Iolkos, the city of Jason. A well-constructed wide road and several houses were also uncovered, although work is still in progress. Records on the Mycenaeans are very sparse, usually being limited to myths and legends. Many of their leaders are semi or wholly legendary. The latter are backed in lilac, usually for events prior to the Trojan War. The various Mycenaean city states begin to dominate not only Greece but also the islands of the Aegean and Crete. Iolkos and Mycenae both rise to prominence at this time. 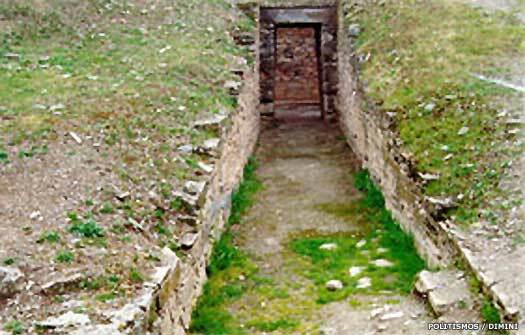 A Mycenaean tholos tomb (named by its archaeological discoverers as 'Lamiospito') is built in the second half of the fourteenth century (the Late Helladic IIIA2 period). It lies three hundred metres west of the Neolithic settlement and is preserved in rather good condition. Even though it is later plundered, it yields rich finds, such as gold jewellery, beads and necklaces of glass-paste, ivory items and bronze weapons. Another tholos tomb is added nearby, about a century later. Son. Possibly killed by Pelias while Jason was away. According to Greek myth, Aeson's mother is Tyro. As well as giving birth to him and his brothers, Pheres and Amythaon, she also has two children by Poseidon, god of the sea. Of the two boys, Neleus and Pelias, the latter seizes the throne of Iolkos and locks Aeson in the dungeon. Aeson's son, Jason, is sent to Chiron to be educated. Half-brother and usurper. Killed by Medea of Kolkis. Pelias is warned by an oracle to beware a man with one sandal who will overthrow him (shown at the start of the classic film, Jason and the Argonauts, 1963). The man is Jason himself, who returns home while Pelias is holding the Olympic games. Pelias sends him on a quest to find the Golden Fleece. Jason himself is roughly datable as he is of the generation that precedes the participants of the Trojan War. He gathers together the Argonauts, the crew of his ship, the Argo, and makes the heroic voyage to Kolkis to secure the Golden Fleece. Along the way he and his crew experience various adventures. In Thrace, Jason rescues King Phineas from harpies. When the Argo makes landfall near the Hellespont, he defeats Amykos of the Bithyni, to the advantage of Lykos of Mysia. Lykos welcomes Jason and entertains him and his men, but the Argo loses two of its crew during this break and gains two Mysians as replacements. Also lost is Idas, who attempts to steal the Mysian throne. Jason's helmsman on the Argo, Euphemus, is the ancestor of Aristoteles, later founder of the colony of Cyrene. Butes, king of the Elymians, is the only member of the crew not to be able to resist the song of the sirens, leaping from the ship to swim to them. Aphrodite saves him by transferring him to Lilybaeum on Sicily. After his return to Iolkos, Jason's new wife, Medea, kills Pelias and the couple flee to Corinth. There, Jason leaves her after the king of Corinth, Creon, offers his own daughter, Glauce. Euripides' play Medea describes how she gains her revenge by sending a dress and golden coronet laced with poison to Glauce which not only kills her but her father too. Son of Aeson. Leader of the Argonauts. Medea is also rumoured to be responsible for the death of her own two children by Jason (accidental or otherwise) and subsequently flees to Thebes and then Athens. In the typical style of Greek myth and legend, Jason loses favour with Hera as a result of breaking his vow to love Medea forever. He dies lonely and unhappy, killed when the stern of the rotting Argo falls on him as he sleeps underneath it. A descendant of the Argo's helmsman, Euphemus, is King Etearchus of Oaxus. The king's maternal grandson is Aristoteles, founder of the colony of Cyrene. The Greek myths and stories about Iolkos end with Jason and his son. Their descendants and successors are unknown, because the only recorders of the kingdom's history (mythical or otherwise) are overthrown throughout much of Mycenaean Greece by the invading Dorians. Archaeological evidence shows that Iolkos is destroyed by fire around this time, suggesting that the city falls to the invading northern tribes. Greece enters a dark age, with only Athens surviving as a Mycenaean refuge.